For visitors to the city, the weather in Montreal can be very strange. It is very hot in the summer, very cold in the winter, and it changes almost every day! It is also something that people in Montreal and in Canada love to talk about: our weather. The winter can be wonderful. 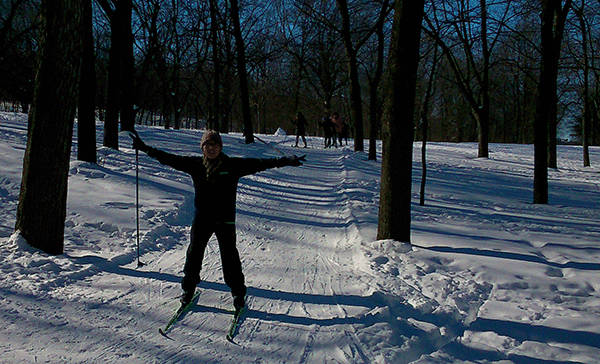 There are fun winter sports to do: skiing, skating and tobogganing. Everything is beautiful. But the winter can be difficult, too. First, it is cold. The normal temperature in January is between 6° and 15°, but it is sometimes colder: 20° or 30°! If you add the wind-chill factor (it feels colder when the wind is blowing), it seems like 40° or colder. Fortunately, most buildings in Canada are designed for winter. They have double windows and lots of insulation to keep heat inside. Second, it is dry. In cold weather, your skin dries out quickly. You can buy creams for your skin and a balm for your lips. You can buy a humidifier for your apartment, or boil some water to put steam in the air. It is important to drink a lot of water. Third, in winter, the days are short. The sun comes up late and goes down early, especially in December. Some people feel sad or depressed in the winter. It is important to get out in the sun when you can. Many Canadians love winter sports. Try skiing or skating. Play in the snow! It is important to keep active in the winter. Organize an exercise programme in the gym. The winter isn’t too bad if you have the right clothes. It is better to wear many layers of clothing. For example, wear an undershirt, a shirt and a sweater. It is warmer to wear layers, because air is trapped between your clothes. This helps to insulate you better. Also, it is easy to take off a layer if you are in a warm room. Always cover your head and neck. In cold weather, we lose 40% of our body heat through our head and neck. Natural fabrics like wool and cotton are warmer in winter. If you are wondering about winter, we prepared a video called Winter 101 that you can watch online. It has lots of suggestions about how to survive in the cold weather in Montreal. You can read the transcript of the video in this pdf document: Winter 101 Script PDF. The spring in Montreal is lovely. Because the winter is so long and cold, Montrealers love the spring and it comes suddenly. The trees become green again quickly and flowers bloom everywhere. The birds come back, and everyone is in a good mood. It becomes warmer in March and by May everyone is enjoying sunny weather. In fact, sometimes the spring feels very short, because the change from cold to warm weather happens so quickly. But, it can rain a lot in the spring, and we sometimes get a last snow in April! Ah, summer in Montreal. The people in Montreal have such a long winter that when summer comes, they really like to enjoy it. The city is exciting and alive. There are many festivals and events to keep us busy outside. Almost every restaurant and coffee shop has an outdoor terrace for customers to sit outside during the summer. A great thing about living in a northern country is that in summer, the days are very long. On the summer solstice (around June 21st), the sun rises before five o’clock and there is still light at 10:00 pm. If you think that Canada is cold all the time, come to Montreal in July and August. It is often 30°C and higher in these months. It can also be very humid. Humidity is when there is a lot of water in the air, and it feels hotter than it really is. In the summer, it can rain a lot, too. Often, there are thunderstorms with a lot of lightning. Be careful in the sun. Always use a sunscreen with a Sun Protection Factor (SPF) of 15 or higher. This is a beautiful time of year in Montreal. It is many people’s favourite season in Montreal. The leaves of the maples and other trees turn from green to yellow, orange, and red, and then they start to fall off the trees. It is nice to walk in the parks to see the beautiful colours. The days begin to get cooler and shorter, and the birds begin to fly south.This is also a nice time to go to the farmer’s markets, like Jean-Talon Market or Atwater Market. The markets are very colourful, full of fresh fruit and vegetables from Quebec, and the prices are very good. The first frost (freezing, 0°C) is usually in October. The first snow is usually in early November, but it can happen earlier or later. The first snow doesn’t last long. What weather can you expect every month in Montreal? Why do we change our clocks? To save energy, and enjoy the long summer days. Montreal is in the Eastern Time Zone (UTC – 5), the same as Toronto, and the eastern United States. However, so we can enjoy the long days in summer after work or school and use less electricity for lights, most of Canada and the U.S. use a system of Daylight Saving time. Every year in the spring, we set our clocks ahead by one hour, and we put them back one hour in the fall. It will be announced on TV and in the newspapers when to change your clocks. The date is the second Sunday in March to go ahead and the first Sunday in November to go back. The change happens at 2:00 AM, so you should change your clocks before you go to bed on Saturday night. Don’t forget that after you change your clock, the time is now an hour different in your country, if your country didn’t change. Canada is so big, we have six time zones! When it is twelve o’clock in Montreal, it is nine o’clock in Vancouver. Montreal, Toronto and Ottawa are in the same time zone: Eastern (EST). Winnipeg is in the Central time zone (CST), Calgary is in the Mountain time zone (MST), and Vancouver is in the Pacific time zone (PST). Halifax and the Maritime provinces are in the Atlantic time zone (AST), and there is also Newfoundland and Labrador, which are on Newfoundland time (NST). It is unusual, because they are 1.5 hours (90 minutes) ahead of our time in Montreal. You can find out the official time in each time zone at the National Research Council’s Web Clock.